The heat recovery ventilation device YBPK-50 (LQ50/200) * is developed for the apartments of usual multifamily apartment houses. But it can also be successfully used in the another small room. The operation of the device is based on the well-known technology of heat and mass exchange in an immobile regenerator which has seldom been applied in ventilation and air-conditioning systems so far. In order to enhance the air interchange in the room the new synchronization approach of two devices was applied. The device can be installed in a renovated or redecorated apartment, during the rearrangement of a building or a new building and house. The device is completely mounted in a wall and it is almost not noticeable in an apartment interior and outside of it. Inflow of fresh air is compulsorily extended in the apartment, instead of remaining near the device. The temperature of fresh air is always close to room temperature in all weathers: in a frost or a heat outside. 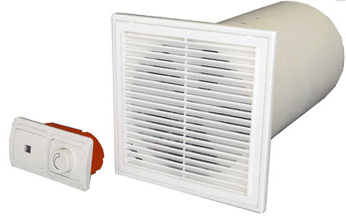 The heating of air in the winter and cooling in the summer is carried out by means of heat recovery, practically without expenditure of energy. The device saves up to 90 % of heat of the heat which is usually exhausted outside together with warm air. Expenses of an apartment heating are cut by half. The device does not lose working capacity in the range from - 40oC to +50oC. The device is equipped with IR-remote control. The working mode of the device can be changeed from any point of the room. Other functions are carried out automatically. At customer's option the device can provide the heat recovery ventilation (basic mode), the supply ventilation (summer mode), the exhaust ventilation, the natural ventilation (night mode). The technical characteristics of YBPK-50 (LQ50/200) are given in the table. 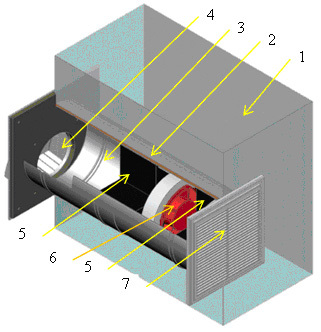 1 - wall; 2 - assembly foam; 3 - telescopic sleeve from the steel; 4 - external deflector; 5 - air-penetrable regenerators; 6 - reversible fan; 7 - internal ventilating lattice with the built in valve.